Home > Cruise Blog > Is It Time To Treat Your Pet To A Cruise? Is It Time To Treat Your Pet To A Cruise? Are you among the 72% of people that fret about going on holiday because they worry about leaving their pet at home? Remarkably, for a very large number of people, their first priority when choosing a holiday is organising what to do with their dog or cat. According to a recent survey a staggering 10.5 million pet owners worry their way through their holiday due to constantly thinking about their cat or dog being left at home. Just as shocking, it was found that one in ten owners will not even take a holiday without their pet. From being slightly alarmed by this information and due to my passion for cruise, I decided to find out: Can we take our pets on a cruise with us? Cruising is the largest growing sector within the travel industry and with over 300 ships to choose from worldwide, it is an increasingly popular holiday choice for so many people. So, with this information and the statistics about pet owners, surely it is possible to take your pet on a cruise? After extensive research, it was not looking hopeful However, I started to understand the reasons why taking your pet on a cruise is not possible. Cruise ships have extremely strict sanitation and health guidelines that they have to adhere to, and this would prove fairly difficult with pets onboard. Just like us, pets need somewhere to sleep, exercise, eat and go to the toilet, so to make this possible in a limited space shared with so many people, would be hard. Secondly, the nature of a cruise holiday is going to more than one country during a sailing. Many countries have strict quarantine and admission requirements for any animals entering the country, therefore this would make it almost impossible. So basically, the only pet that is allowed on a cruise ship is a service animal. Although a service animal is not actually considered a pet, they are an animal that is trained to benefit a person with a disability. 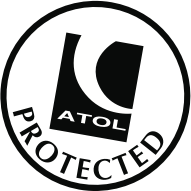 Appropriate paperwork will have to be presented to the cruise line before the cruise and supervision of the animal will be the sole responsibility of the owner at all times. Owners will also be responsible for obtaining all required permits for service animals to leave the ship in port of call. On most cruise lines, service animals are allowed to go in all onboard venues, including all dining areas. I can imagine you are now wondering, where they go to the toilet!? A popular question amongst cruisers, believe it or not! Well, they will have a special ‘Botty Box’ which will vary in size and location depending on the cruise line. So, just as I was wrapping up my research and findings about pets on cruise ships… hang on… pet friendly cruise ship? How could this be right after everything I found out about not allowing this? Well, it turns out there is one exception to the rule. British cruise line, Cunard, operates the ‘Pets on Deck’ programme, allowing owners to bring their pets on a cruise with them. Cunard’s Queen Mary 2 is an approved carrier in connection with the Pet Travel Scheme and allows dogs, cats and other furry favourites to go on a luxury transatlantic sailing with their owners. 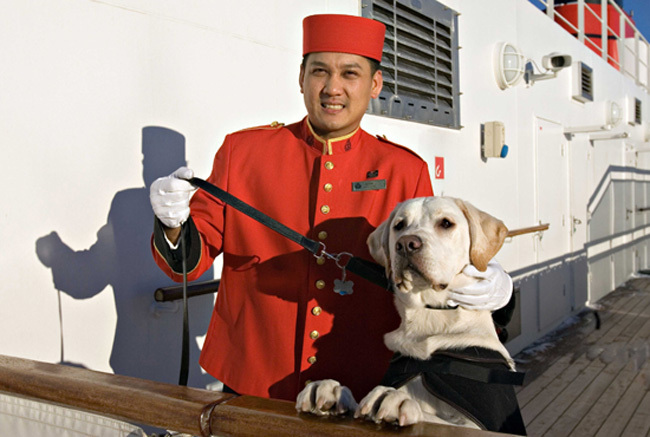 Pets onboard the Queen Mary 2 receive the same pampering as their owners. Boasting spacious pet kennels with a full-time kennel master, they have the ultimate luxury pet accommodation… with their own private ‘pet butler’! The area also has an indoor play zone where dogs and cats can play with each other, or if stated by the owner they can have an individual playtime. Dogs are walked outdoors several times a day and also have visiting hours for the owners to go and visit them. Fine dining? Of course! Freshly baked, healthy, gourmet doggie or kitty cookies are offered on a daily basis as well as meal times requested by owner. Even overnight, pets are never left unattended and there is someone caring for them 24 hours a day. As for safety, all pets have their own life vests too! Those guests with pets are taught how to put them on during the emergency drill. As if all of this was not enough, pets are also supplied with a complimentary gift pack which includes toys, personalized name tag, food dish, portrait with owner and a personalized cruise card. Lucky little things! Cunard has supported the pet-friendly policy since the maiden voyage of the Britannia in 1840 when three cats were on board and since then thousands of pets have enjoyed the Cunard treatment, including, a monkey, canaries and a circus elephant! With such star treatment it’s no wonder that even some celebrity pets have cruised with Cunard including, Elizabeth Taylor with her dog, The Duke and Duchess of Windsor with their puppy and most recently Britain’s most famous dog, Pudsey, cruised with his owner Ashley. Being a dog owner myself, I know how attached we are to our pets and if I could have taken my dog with me to sea I would have! Pets On Deck truely is an incredible concept and I know you are having second thoughts about your next holiday now. Be aware that there is a limit to 12 pets per cruise so they book up fast!